I’ve told this story many times, but it has never gotten any easier. The first time I visited Switzerland, I was a mess. I’m a mess in the morning—mess doesn’t begin to describe the state I was in. They don’t make superlatives big enough to quantify just how badly I was doing. I was broken, reeling from what was, and still is, one of the most defining moments in my life, and what was the end of one of the most important people in it. Typically, in situations like this, the words tragic and passed away would be used. Tragic doesn’t do his loss justice, at least not to me, or my family, or his family, and he didn’t pass away. Passing away implies peacefulness, moving on at your appointed time. Nicholas was barely in his twenties, with so much life in front of him, in front of us, but he fell down the stairs and, for all intents and purposes, died right in front of my eyes at my parents’ house on a bright morning in Louisiana in 2007. Just like that, everything changed. I had this vision of how my life would be, how our life would be, and in the span of a few seconds the dream exploded, and I was left without the person I loved more than anything. We were supposed to be getting ready for this amazing trip to Europe as part of a summer school program through our university in Innsbruck. We were German nuts at the time. Nicholas loved cars, especially fast ones, and by proxy, so did I. The Autobahn was this word, an idea, something we watched incredulously on YouTube or on Top Gear. It didn’t seem like a real place. We were going to see that. I think he would have preferred Germany, but Austria was an acceptable substitute, only a short trip away from the land of BMWs, Audis, and Porsches. Instead, I found myself in pieces in a hospital room, on his bed, curled up next to him, holding my Nicholas, saying good-bye to someone who had already left. That’s where my old life ended. A significant part of me died that day, and the whole of me could have gone as well, but that’s where a new life began—slowly, painfully. A new life had to begin. It was the only choice I was left with. What do you do? Even in the worst moments, when I thought that I’d never be happy again, I knew there was more to live for, more to do, and that someday I’d be happy again. So I went to Innsbruck. That summer wasn’t what it was supposed to be, but I felt I should go. I wanted to see what it was like, to hear if people really said Ja! like we thought, to gawk at the fast cars he so admired, and try to model ourselves after the ze Germans, well, ze Austrians. Enter Susan, stage left. I met Susan by chance earlier that summer. Before any of the bad stuff happened. I told her of my plans for the summer, and she told me when I was in Europe that I should come stay at her home in Switzerland. I did contact Susan. I’m not sure I was what she had bargained for, but she welcomed me to her home nonetheless. I’ve heard the expression that people move in and out of your life at certain times for certain reasons. I’m not sure how I feel about most beliefs like that, but I know that Susan was in a way a magician. She took my broken heart and soul on walks with her dog, she took me to the grocery store to buy ridiculously overpriced bananas, she introduced me to her friends and made me what I now understand as a very hearty European breakfast. She made me feel normal. In this simplicity, through her kindness, she began to breathe life into my spirit again. She took me hiking, wandern gehen. I love that combination of words. I needed to go wandering. I remember the slow return of excitement, the return of happy feelings. I felt pleasure in Susan’s company, about where I was, about the amazing scenery I saw around me. I took hundreds of pictures of flowers. Unfortunately, it was in a time long before I learned to take a decent image, most of them are out of focus, but they remain in my memory, tack sharp, vibrant, and soft to the touch. I haven’t spent much time in Switzerland since that summer, but every time I’m there I think of her, and I think of Nicholas. I think of those early days, and I remember the pain, I remember what it felt like to be there with her, I remember how she took me in, and I remember slowly feeling some form of happiness reemerge. In February of the next year, I met Jered. I was walking, he was on his bike. Long story short, we both fell for each other—hard. Just like that. As quickly as Nicholas left my life, Jered entered into it. I didn’t want to let him in, I wasn’t ready to let him in, but he barged right in against my will and picked up my heart and held me when I cried and loved me. I couldn’t help but do the same. Early on, he gave me a bike. From the beginning, he taught me that a bike was a tool, and not to be too hung up on the aesthetics. Clean what needs to be cleaned, but not to obsess. I grabbed hold of the idea of the bike as a tool. My bike became my tool for healing. There was a period in each day where I could clear my head, work through the demons that still trailed after me like a disease with no cure. I could do whatever I wanted on the bike. 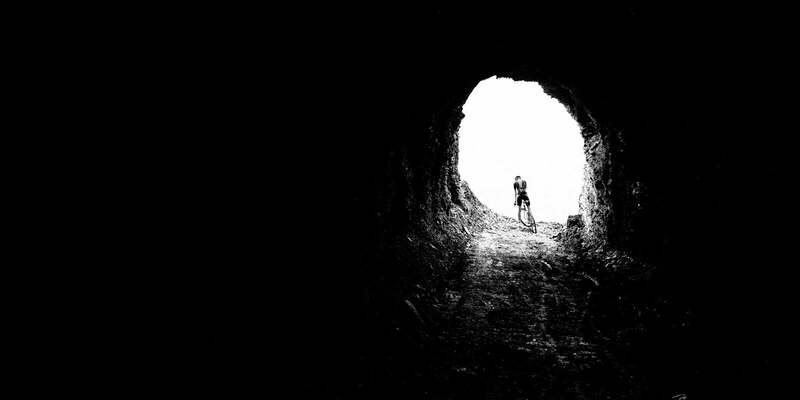 I could explore the limits of the physical realm, and in so doing explore those dark places of pain, caused by my pedaling and my memories alike. I could thrash myself until I was well beyond the point of comfort, simply suffering, but when I did, it made me appreciate being alive. I needed to feel alive. I needed to live and to continue on, because Nicholas couldn’t. I needed to feel the sun coming through the trees, the searing pain in my legs, the cool breeze on my cheek, the sweat dripping off of my nose, the wind in grass, the welcome entrance of exhaustion. In those times, I felt like I was taking my healing into my own hands, instead of waiting by the side of the road, hoping for it to find me. I loved it. Fast-forward five years, and we crossed over the border into Switzerland in our little gray van. Jered and I are inseparable—constant companions, homeless by choice, in search of good people, roads, stories, and images. I haven’t spoken to Susan in a very long time, but as we crossed into Switzerland and I tried to pull in the view, I thought about her, and I thought about Nicholas. I think I always will. The week before Nicholas’ birthday we set out to adventure. We set out to live. The mammoth ascent of the Col du Sanetsch was the longest climb I’d ever done, measuring in at 27 kilometers and 1,800 meters of vertical gain from Sion to the top, and the first part of the most mountainous ride I’ve ever done. The heat was oppressive from the beginning. After a bakery stop, we were passed at great speed by an old man in a suit. We slumped low at the crushing blow landed by the bespoke businessman only to perk up when we realized he was on an e-bike. I thought about that e-bike as we tilted up with the near vertical concrete paths through the vineyards that drape the lower flanks of the mountains outside of Sion. I wished I were on an e-bike as I battled a 30% section of road, catching my breath each time an ice-cold shower from the sprinklers working at full blast in the vineyards hit me. I love riding on the small roads through vineyards, despite the fact that they are almost unanimously steep. I like them even more when the roads are blanketed in freezing-cold water on a hot day. After cresting that scowling piece of pavement, the gradient eased off slightly to something closer to hospitable, and we saw the full scope of the vineyards, the rich, green, flowing locks of Mother Earth’s braided hair. I’m sure someone else has said it far more eloquently than that at some point, but that’s always what I think of. We pushed upward through the oven of the lower, exposed canyon slopes. I fought my bike and the road. I trudged. We stopped for Switzerland’s sweet carbonated beverage of choice, Rivella, on the way up, and chatted with the lady at the bar. She couldn’t believe I was from Louisiana. What on earth was a girl all the way from Louisiana doing in a bar in the middle of nowhere in Switzerland. The stop did me good, and our slow progress was still progress nonetheless. We finally nosed out of the heat after a quick succession of switchbacks and into the cooler upper reaches of the climb. The views opened wide and ushered us into the heavens. This is what we had heard about—the upper section of the climb that makes it unforgettable. The mountains formed a wall around us in every direction. We rode through a great amphitheater of rock, with blooming mountain wildflowers providing the song to the mountains’ quiet. We pushed higher. We passed through tunnels, entered into Mordor, passed through another never-ending tunnel with automatic lights, returned to the light, left the gray rocks behind, and entered into beautiful green high-alpine pastures. A few minutes later, we crested the giant without fanfare, without a crowded hut, no motorbikes, no cars, and no tourists. There were no stickers to blot out the letters of the pass, because there wasn’t a pass sign, just a small yellow marker indicating the isolated bus stop. I took a moment to look back at the valley below, the mountain we had climbed, the mountain I had climbed, the mountain I had climbed the last few years, and I was content. We dropped down along a road barely as wide as I am tall, swooped past a dammed lake, and stopped at a dead end. This is where things got interesting. There’s no road down the other side from the top of the Col du Sanetsch, but there is a gondola to Gsteig. We got in with a few curious hikers and their dog. We went down, down, down—many hundreds of meters—and we laughed at the most unique descent we’ve ever done. When was the last time you took a gondola off of a mountain on a road bike ride? The gondola dropped us down into Gsteig. If ever there was a town that embodied every single Swiss stereotype in the span of about 15 seconds of riding, this was it. The sun shone brightly on the dark brown houses, which helped highlight the bright flowers that adorned the facades all the more. A small church poked through a small gap in the houses. Three little girls giggled outside of a house, but we could barely see them for all the rampantly growing flowers, eager to get as close to the sun as they could before the autumn brought them back to earth. We climbed, and we descended. We rode into valleys that looked impossible to climb out of. When we crested, we were treated to gleeful descents, and we laughed at the views and wondered how it was possible that Switzerland was so different from any other place. It isn’t overrated. It is that beautiful. We slowly grew tired as the day grew older and were promptly brought back to reality when it became obvious that our late start would be punished. Storm clouds had been building in the distance for most of the day, light was running short, and with 40 km still to go, the clouds delivered on their threat. Disheartened, we scurried under the roof of an unused fruit shack and watched the rain hurtle down, exploding against rapidly forming puddles, promising an instant soak to anyone who dared stick a toe out from hiding. We were going to get wet. At least we had a plastic bag for Jered to cover his camera; I was proud of myself for insisting that he take it. It was 7:30 p.m., pouring rain, and the wind was howling against us. Jered took the lead. We put our heads down, and we ground our way back to Sion. We arrived to the town in the last light of the day, just as the rain grew tired and moved along to some other mountain valley. Exhausted and hungry, a McDonald’s greeted us. We smiled, tossed our bikes against a dripping bush, and clomped proudly into the brightly lit building. We stank of sweat and rain, we were muddy, and we were hungry. We ordered far too much, ate most all of it, and when we couldn’t stomach anymore, we shoved a cheeseburger and french fries into our pockets and took them back to our hotel for the next course. That was a good day. Sometimes, you just need to get on your bike and smile at the sky. The Grubers have been writing and photographing for peloton since Issue 01. From Issue 25. Buy it here.